One of the most important things we all do when it comes to food issues and eating gluten free is reading labels. We do it everyday. We do it every time we go shopping. When you eat gluten free you have to read labels basically every time you put something in your mouth. It is a fact of life when you are gluten free or dealing with other serious food allergies. And because it is such an important part of the gluten free life it is very important to teach our kids how to read labels. Now, this is not as easy as it seems because we all know how difficult and confusing reading labels can be, but there are some basic words and ingredients we can teach our kids to look for. Once a child reaches an age where they can read well and understand more about food, I encourage you to take them shopping with you and show them the basics for making sure food is safe to eat before you buy it. Teach them what to look out for and what to avoid. And teach them the ways to stay on guard. For older kids it is easy to show them how to navigate gluten free eating using the internet. Show them company websites and how to search to find out if something is gluten free and safe to eat. These are skills that kids will need to know as they grow up and go off on their own. Taking some time to teach your gluten free child about reading labels is a skill that they will be grateful for later in life. If you would like some more information on reading labels The Gluten Free Homemaker shared some helpful tips for reading labels last week. 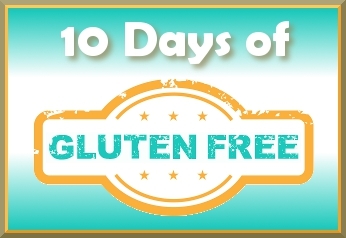 For more great gluten free information and giveaways please visit the other bloggers joining in on the 10 Days of Gluten Free. And here are the details for my giveaway. I am giving away one $25 Bob’s Red Mill gift card that is good for their online store and one copy of my Cooking 101 For Kids ebook to one reader. Great advice. It pays to educate them early. I totally agree, they need to learn at a young age how to read labels, so they can watch for things themselves. This is something I need to do for my girls since I do the shopping mostly while they are in school. We just learned my husband needs to be on a glutten free diet and probably some of our children as well. Thank youf for posting this information and links. I have much to learn! I think learning to read labels as a kid is super important and you have to do it every time because ingredients change or products are manufactured at different facilities. Just because a food was “safe” doesn’t mean it always will be, so learning to read labels before you buy or eat is so necessary. When kids don’t know what they can and can not have it’s hard for them to be their own advocate when at school, friends houses, etc. I learned early on what gluten was and where it hides. Such wonderful advise, thank you. My son always says “mommy does this have gluten in it, can you eat it” so cute! I just discovered your blog. We are newly gluten-free. My kids are too young to read but I even find myself forgetting to check the labels sometimes. Err. Even my grandkids are aware of my need for the gluten free diet. I’m always concerned that they may have to someday go gluten free, too. Great advice. Mom will not be around for ever to call up and ask a gluten-free ingredient question. My son still calls me once in a while. I taught my allergic daughter to read labels at the grocery store . It was her job to help me while we were shopping. My kids are very well schooled in nutrition labels…they are 11 & 9 and are constantly ‘teaching’ nutrition to our relatives! My 4 y/o will learn early too since he is allergic to eggs and nuts. Kids? I’d be thrilled if I could teach my husband this skill. He is constantly coming home with things we can’t eat because he won’t read the labels first. The same month our son was diagnosed (October 2010) a friend was watching him and her son wanted a cookie. She told me later, “I hated to give P a cookie, but C had his GF snack so I did. C asked if the cookies were gluten free and I said I don’t know. C said, ‘Let me see the package’ and turned it over, looking for the label!” He was 3 at the time! He now reads labels with us and loves to see the words Gluten Free, as do we. Praise God for early diagnosis and easy acceptance! Still lots to learn about hidden gluten and cross contamination but he definitely has a good foundation. This section is so timely for me, thanks! Reading labels not only helps for gluten free, but also for making healthy eating decisions.